Keswick Mountain Rescue Team was alerted by police about 10.50am on Monday after the walkers called for help. They had wandered off-route between the car park at Seatoller and Castle Crag in Borrowdale. Team members had to put their local knowledge to good use to locate the pair, with a grid reference – that is, a mention of a cattle grid – providing the best clue. Two of the team were dropped off near Longthwaite youth hostel, another two set off from Seatoller car park and the last two went back to explore above Rosthwaite. The team spokesperson said, in theory, this covered all the steep ground around High Doat and Johnny Wood between Seatoller and Castle Crag. “Further calls gained more clues including them being able to see a cattle grid,” the spokesperson said. “There aren’t many cattle grids in Borrowdale, the only one in the area being on the road up Honister. “A second team had already been dispatched so they were tasked to search the slopes above the Honister road. 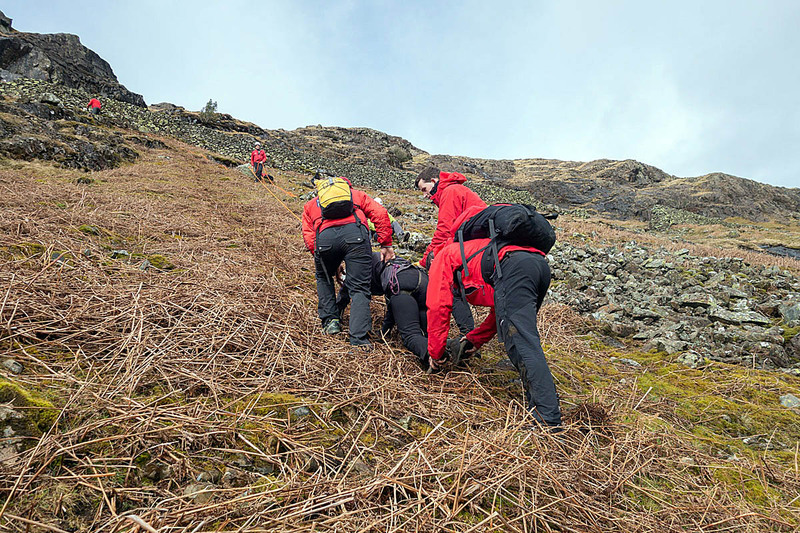 The rescue lasted almost three hours and involved 11 volunteers from Keswick MRT.